More than 100 firefighters are tackling a fire that started in a restaurant and office block in central London. 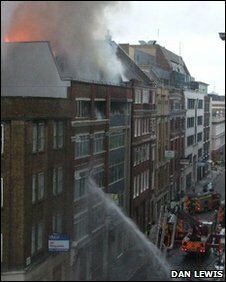 Flames took hold at about 0400 GMT at the four-storey building in Tabernacle Street, on the border between Shoreditch and the City of London. It is believed the fire started at the Sosho Restaurant before spreading. Some 20 fire-engines are at the scene and spilling over into City Road, which is partly closed. 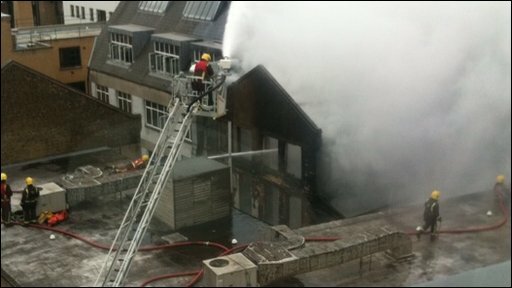 A BBC reporter said the fire had spread to two buildings. Smoke can be seen as far away as Hackney and Liverpool Street Station, with London Fire Brigade taking numerous calls from people in surrounding areas. Local resident Dan Lewis said: "I was in bed and heard an explosion at about 0630. "We heard several fire engines arrive and I can see 11 engines from my window." A London Fire Brigade spokesman said 50% of the roof was alight, with flames also inside the building and especially strong on the second and third floors. He continued: "There is a lot of smoke and it can be seen from quite a distance. "There is a lot of fire inside the building." He added that it was impossible to tell the level of damage to the building at this stage. The cause of the fire was still unknown, he added. A Metropolitan Police spokeswoman said: "We will be there assisting with cordons. "We will be making sure people in the area are safe." Tabernacle Street and City Road from Old Street to Finsbury Square remain closed. There are also partial closures on Worship Street, Paul Street and Bonhill Street. Police have reported that the fire is now under control.